The Croatia Reggae Festival will be opening the summer festival season for the first time in the center of Split on Bacvice Beach along the Adriatic coast. 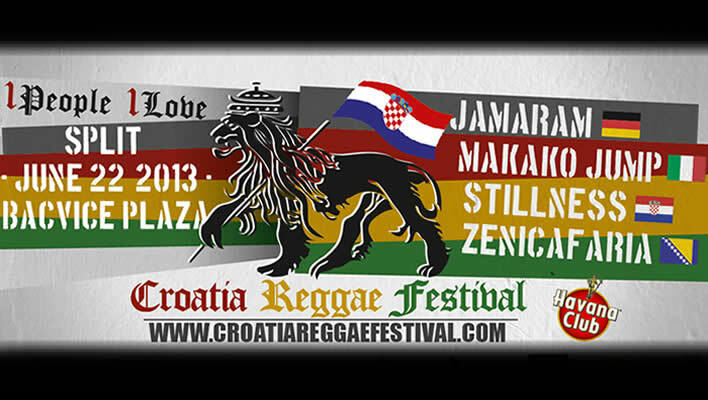 With bands from germany, italy, croatia and bosnia we are celebrating our entrance into the European union on July 1,2013 with Reggae music, beach party and one of the coolest events of the year. Ad to this havana club rum bars, a red bull water event “picigin” with cheerleaders, fantastic Croatian barb-que, sun, sand, surf and beautiful people from all over Europe. Music with a message will be presented from JAMARAM, MAKAKO JUMP, ST!ILLNESS and ZENICAFARIA! From classic reggae, dub, hip hop, latino and more, theses bands promise animation pure, unforgettable sounds, rythms and text, and simply an incredible night under the stars for friendship, love and peace…Come join us in our celebration of life, music, and nature, and share in one of the most unique and coolest events here in the region. Welcome to Croatia, we await you with open arms!